As I watched an intimate scene between father and son bonding over a shared experience, making popcorn, my adoration for live theatre was renewed. An open stage in a packed house. Entranced as you fall in love with fantastical characters. As a transgender woman it holds a certain appeal. Committed acting, costuming to sell the illusion feels frighteningly familiar. To protect myself from others I presented a male artifice to the world; adapted male clothing and behavior. Breaking free of assumed gender roles requires unfathomable sacrifice and courage. 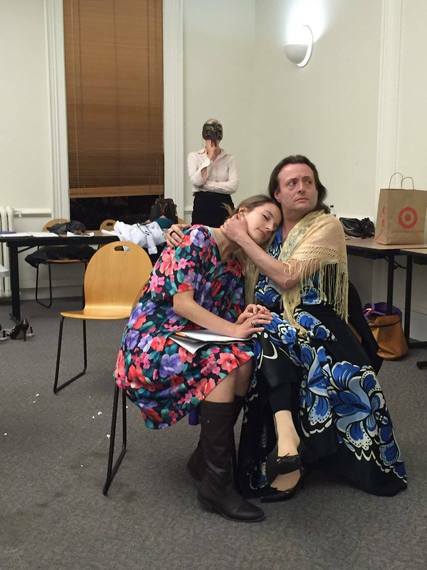 To capture that, what it is to be Trans, on stage -- is miraculous. I was honored to be a guest speaker at this October's Your True Gender Conference. Held at Cal Poly in picturesque San Luis Obispo, organized by co-founders Jessica Lynn and Peggy Jones; this three day event quickly became the largest gathering of its kind on the west coast, thanks in part to the small army of dedicated volunteers and local LGBTQ groups. At an event highlighting transgender healthcare, law and education; packed with guest speakers such as world renowned surgeons Dr. Marci Bowers and Dr. Joel Beck, celebrities Janet Mock and Isis King, the highlight for most in attendance was a the world premiere of Dear Texas. The brainchild behind the one act play, Dear Texas, is playwright Jane Eisner who was inspired by transgender stories she heard. After documenting the transition of a close friend, Eisner began working as a reporter/associate editor at San Francisco based FourTwoNine Magazine covering Transgender news, politics and culture, Eisner was given the opportunity to talk with a multitude of Trans identified people. She made the decision to leave the magazine and pursue her interest in Tran's stories full time. Eisner wanted to focus on transition in a wider life context and on the beauty inherent in transitioning. 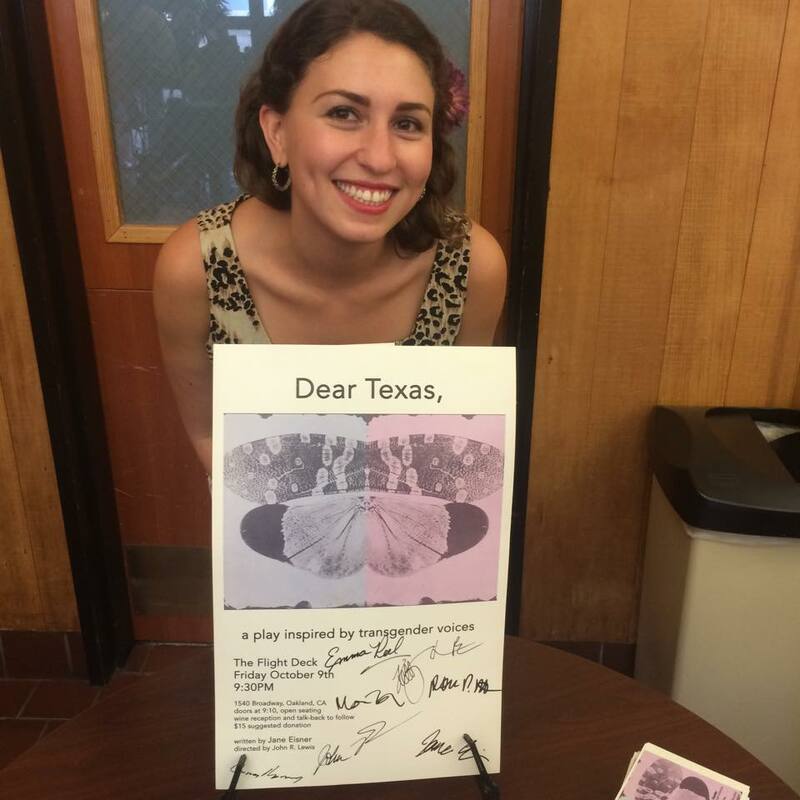 Dear Texas, began its life as a staged reading. However that all changed when Eisner brought in director John R. Lewis. What emerged was a bigger vision. A full stage play with costuming, set changes and music. When I first sat in the auditorium to view the play, I hadn't known about the short 4 week rehearsal time or its evolution from script read to full blown production. All the more impressive in hindsight. The play is brought to life by a small ensemble cast of diverse players. 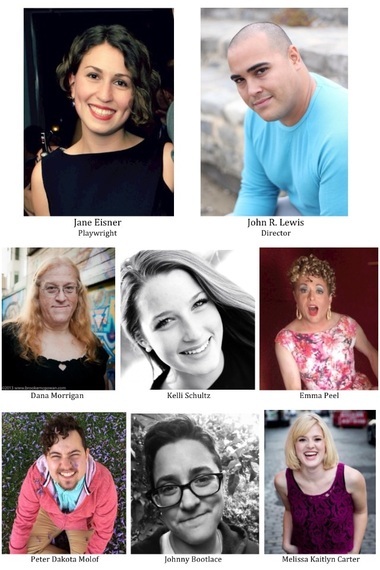 Eisner wanted to ensure the cast included Trans identified actors in Trans roles; bringing a modicum of authenticity often lacking in film and television productions which tend to hire cisgender (non-trans) actors for transgender parts. Every intimate moment, every tear and smile feels real. As one of the actors I spoke with pointed out, that no one in the cast was trying to care, they just did. The result was a truly riveting and credible portrayal of Trans lives. A woman fighting to keep her son; a chance meeting between a boy and a girl; a loving couple awaiting a life changing procedure. None of these main themes are exclusive to the transgender community. They are universal; that was the point. Jane Eisner wanted to highlight human stories. They just happen to be transgender. That doesn't mean the Trans narrative is secondary. They act as modifiers enhancing, putting a spotlight on the idea that transgender people face unique circumstances. Even in the context of common universal themes. The most powerful moments for me are done in between the set changes. Monologues preceded by Dear Texas, different characters of the play expressing internal thoughts. While the play covers three different stories created from the many interviews Eisner conducted, it is Virginia's story that gave rise to the title of Dear Texas. Based in part on Your True Gender co-founder Jessica Lynn's loss of her youngest child to her ex-wife in Texas; deciding that her transition was endangering the well being of her son. Jessica was in attendance to the premiere of the play. The actors playing her and the son both expressed what an honor it was to portray these roles in front of Jessica, and the sense of immense sadness they felt for her in those moments. The writing, directing and acting are as beautiful as they are profoundly heartbreaking. Dear Texas allows a perspective into Trans identified lives that cannot be ignored. Its potency was an unexpected gut punch. A resurgence of every bad memory; every night I spent crying myself to sleep; every plea for help. It left me utterly destroyed. Breaking down the walls I built up to hide from the pain. With a waterfall raining down my blouse I wasn't just impacted by it, I was irrevocably changed. I may have been seated in the audience. But the play told my story. I was in it, part of it. A perfect reflection of my every thought; of my suffering and triumphs. It was no surprise to me when the conclusion was met with a standing ovation. Smiles upon tear drenched faces, cheering for this brilliant art piece. The lead in for some of its most powerful speeches, Dear Texas, has inspired me to contribute a part of myself, as I hope others will do the same. Dear Texas, My identity is not up for debate. My womanhood promotes the very core of feminist thought. That women have worth beyond the notions of grace and beauty. That we are not our bodies, but our hearts, our minds.